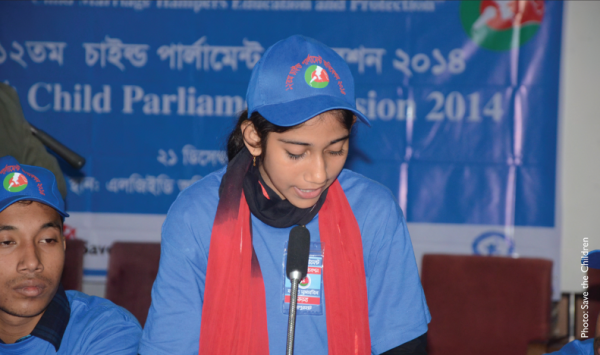 The Child Rights Governance sector (CRG) works with civil society coalitions, parliamentarians, young people, and in partnerships with institutions such as the National Human Rights Commission to advocate for better legal protection, strategic policy formulation and investment for children in Bangladesh. Examples include our ongoing campaign for the establishment of a Child Rights Commission to protect and advocate for children’s interests, and our support for the creation of a dedicated Child Directorate to better coordinate government priorities and investment in children’s lives. CRG monitors and ‘demands’ child rights through highlighting obligations under international treaties, but also through building innovations, such as Kolorob, an online platform and smartphone application, with an ambition to improve public service delivery and responsiveness in the poorest urban areas. Likewise, we demonstrate the transformative impact of youth led social accountability, through our Child Friendly Local Governance and Child Sensitive Social Protection models. These illustrate how harnessing our youngest citizens’ potential to engage with the institutions that govern their education, health and local environment, reaps the twin benefits of empowerment and better service delivery. Finally, we pursue more technical avenues for achieving child rights through our public investment in children work- analyzing the public fiscal space for children and working towards its expansion. We will build on and refine these approaches through a more integrated model of policy, rights and governance work. In 2016-2018 we aim to directly contribute to the national and local governance landscape from a child-sensitive perspective, especially in the areas of social policy and public finance. We will do this by generating, documenting and sharing robust data, for example, on the social cost of children left behind due to labour migration with the IOM and BRAC. This is in line with the Government’s 7th Five Year Plan, which recognises the role of migration in poverty reduction – but there is little evidence about its impact on children. Our plan also involves targeting social safety nets to include child-sensitive elements. It is widely recognised that social protection has contributed to extreme poverty reduction, but national level gains have not always translated to child poverty reduction. We will work with key line ministries and development partners to ensure adolescent girls, in particular, are not left behind. This aligns with the Government’s National Social Security Strategy 2015 which prioritises this demographic as a target group. In partnership with coalitions, child-led organisations and other civil society counterparts, we will target the most deprived children for greater inclusion and equitable policies, services and resource allocation. Our plan includes supporting development of economically empowering financial products and services for children, for example street and working children who need sound savings mechanisms but remain cut off from the mainstream banking sector. This offers opportunities to the Bangladesh Bank to fulfil its ambitions on financial inclusion for all citizens, including the youngest. We will work with the Ministry of Finance to ensure that a framework for child-sensitive budgeting is transparent, credible and accountable.